Those of you that share my delight at I Hate’s series of reissues of what is increasingly looking like the entire back discography of cult Czech band Root have another reason to celebrate as their third album The Temple In The Underworld gets an outing this week. It’s leaps and bounds ahead of its predecessor, the excellent Hell Symphony, taking the Black/Thrash template and adding the experimental Heavy Metal styling that would grab my attention on the stellar The Book. Here, however, although the songwriting isn’t quite as good as there, the riffs are simply amazing, prog-tinged creations of epic melody that will have you gasping with pleasurable shock even as you headbang. Seriously, the hordes of Thrashers out there will have their socks blown off by even a few seconds of first track proper Casilda’s Song, which starts out with epic Heavy Metal and builds until Big Boss begins to sing and snarl in his usual inimitable way. The riffing speeds up, taking a catchy beatdown that most modern Thrash bands would kill to have thought of and the tension builds until the music reaches an almost transcendental point, announcing the band’s presence in style. Of course, you could take nearly any song and be blown away by the band’s skill and ability (especially the new drummer) but the album seems to have been written to be listened to in one go, from the Intro piece using an excerpt from Beethoven’s Moonlight Sonata to the mid-paced Folk-touched title track. That latter song features some rather amazing grandiosity, Big Boss’ snarl setting you up well for the exultant latter section which ends in a total Thrash meltdown. Of course, Root being Root, the next song Aposiopesis is very different, slow and having a distinct and utterly strange early grunge feel (think Alice In Chains or early Soundgarden). There’s a rather awesome music video for this track available on YouTube (link below!). Even interlude moments like the minimalist synth of The Solitude and acapella choir of Voices From... are gripping, but the best songs are the riff-packed ones, the Doomy, intricate Thrash of The Wall and The Old Ones, a Chthonic hymn of praise. Message is probably the album highlight, having an anthemic feel and plenty of killer riffing, but it also features Big Boss’ best vocal performance yet, moving between low snarls and his deep singing, with a rather excellent growl towards the end. Of course, the acoustic My Name... that finished the original album off is also terrific, Big Boss relatively subdued but singing his heart out. I’m an unrestrained fanboy for him, I know, but he is genuinely one of the most original and interesting vocalists in the Metal world and deserves all the praise I can give. As great as the original album is, the bonus tracks that make up this rerelease are pretty darn good, adding over a quarter of an hour of music. My Deep Mystery is a catchy continuation of the occult themes explored thus far with a great solo, Freebee is a bizarre one-minute track that goes from goofy helium-fuelled vocals to spoken word under a basic keyboard melody and some blastbeats, and Poslove & Temnot (Messengers From Darkness) is more Thrashy goodness. There’s a Metal version of the aforementioned My Name... that’s of equally high quality as the original, and a fun live version of The Old Ones, Big Boss’ vocals even more extreme live; all creating a great addition to an already excellent album. 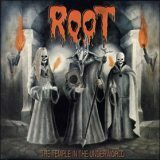 Although again I find myself comparing a Root album unfavourably to The Book, there’s more than enough excellence contained on The Temple In The Underworld to make a vital part of any Root collection, and is highly recommended for fans looking for more, more, more! from this sadly underappreciated band.